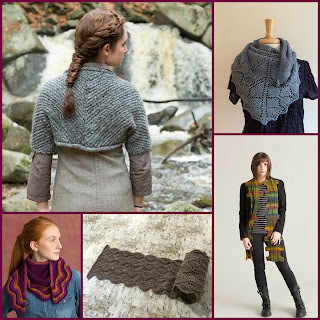 Our very own Susan Mills is the Designer of the Month over at Patternfish. Below is part of their recently released interview with her. You can find the rest in the Patternfish Newsletter here. We’re so delighted to have Susan Mills, prolific and talented designer and Creative Director of Classic Elite Yarns, as our November Designer of the Month. We were interested in her perspectives on designing and her views on the changes that have taken place since she began in the fibre world in 1992. 'Leona' in Mesa, 'Shelburne' in Tiverton Tweed, & 'Albright' in Fresco. You have had an amazing 20+ year career in the fibre world. Any predictions about how it will change in the next 10? What do you think you will be doing? I am one of a fortunate few to have made a career in the yarn industry, starting at Classic Elite in 1992, then moving on to JCA and Westminster Fibers/Nashua Handknits. I came back to CEY in 2009. The internet has completely changed the handknitting industry. 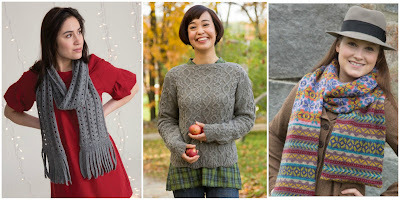 Downloadable patterns and YouTube videos to teach techniques have helped spread the popularity of knitting. More people than ever are knitting and that’s wonderful. But, even though more people than ever are knitting, it’s tougher than ever before for LYS's to survive. So much yarn is bought and sold online (and at fiber festivals and other knitting events). The handknitting industry is certainly not alone in this but ours is a tactile, hands on business that can’t take place completely online. LYSs are vital in creating, inspiring and encouraging knitters, especially new knitters. We’re an industry made up of small companies - CEY has 15 employees yet we’re often considered to be one of the big yarn companies. Yarn companies that only sell directly to knitters and aren’t in yarn shops are profiting at the expense of the LYSs. They are making more money for themselves, but ultimately are not helping the industry to grow and remain healthy. With a growing interest in slow fashion and handwork of every kind, I think that handknitting will continue to grow and become even more mainstream than it is currently. The proliferation of stores combining knitting and sewing (or other crafts) will help knitting grow in popularity. I wish I had a crystal ball and could tell where it all is heading, but I hope in 10 years I’m still surrounded by yarn and dreaming up new designs. 'Lacole' & 'Silverdale' in Mohawk Wool, 'Bishop Of Aberdeen' in Liberty Wool Light. We also wanted to know what the creative director for a major yarn company and pattern publisher actually does. To find out what she had to say, see Susan's interesting insights into the workings of the CEY creative team. Have you looked at the calendar lately? It's only 6 weeks until Christmas and Kwanza, 3 and a 1/2 weeks until Hanukkah begins and 7 weeks until New Year's Eve. Whoa. No matter what holidays you celebrate, if your plan is to hand make gifts, it's definitely time to kick it into high gear. So, let us help you out with these ideas of gifts that there are still time to make. With 6-7 weeks left, the days are getting short so how about a scarf or beautiful shawl? 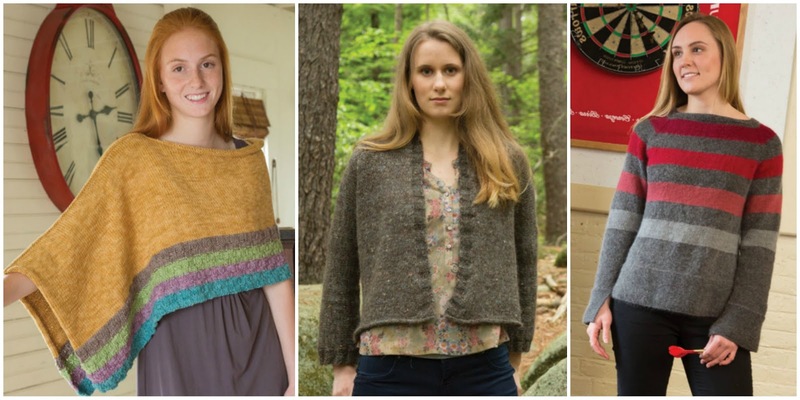 If you're a fast knitter, how about the Walden shrug by Susan Mills in soft and cozy Tiverton Tweed (top left corner below)? More great gift patterns to knit (clockwise from top right above): Telluride Shawlette in Telluride, Wellington scarf in Camelot, Mohawk Wool Leaf Scarf in Mohawk Wool, or perhaps Lucretia in Liberty Wool Light. Giving handmade gifts is supposed to bring joy to both the giver and the receiver, isn't it?. So, if you're going to give handmade, start now with a visit to your local yarn store and cast on. We want you to enjoy making the gift just as much as your loved one will enjoy wearing it.